Nellie Bly (1864–1922) was the pen name of American journalist Elizabeth Jane Cochran, whose best-known works are Ten Days in a Mad-House and Around the World in Seventy-Two Days. A pioneer of investigative journalism, her work often focused on issues of corruption and poverty and gave voice to disenfranchised groups. 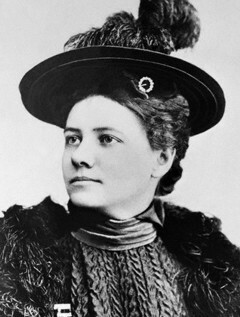 She first wrote for the Pittsburgh Dispatch, where she became a foreign correspondent in Mexico, and later for Joseph Pulitzer's New York World and the New York Evening Journal, covering stories including the Pullman Railroad strike and the 1913 women's suffrage convention and profiling figures including Susan B. Anthony and anarchist Emma Goldman. Bly died of pneumonia in 1922.